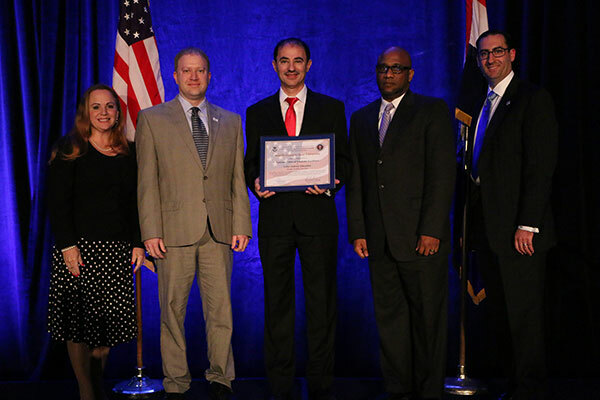 Faculty members from Middle Georgia State University's School of Information Technology traveled to Kansas City this week to receive official recognition as one of eight new National Centers of Academic Excellence in Cyber Defense (CAE-CDE). Diane Janosek, Commandant for National Cryptologic Schools for the National Security Agency (NSA) and Daniel Stein, Department of Homeland Security Education and Awareness Branch, were on hand at the ceremony on November 2 to formally present the designation. The National Centers of Academic Excellence (CAE) program is jointly sponsored by the NSA and DHS. Universities are designated based on their robust degree programs and close alignment to specific cybersecurity-related knowledge units, validated by subject matter experts in the field. CAE graduates help protect national security information systems,commercial networks, and critical information infrastructure in the private and public sectors. Last November, Middle Georgia State launched the Center for Cybersecurity Education and Applied Research (CCEAR) to support the University’s mission to educate and graduate inspired, lifelong learners whose scholarship and careers enhance the region through professional leadership,innovative partnerships and community engagement. The mission of CCEAR is to educate the future cybersecurity workforce and provide consultation to local businesses, governmental units, and interested parties. According to Karen Leuschner, national CAE program manager with the NSA, the University’s ability to meet the increasing demands of the program criteria will serve the nation well in contributing to the protection of the National Information Infrastructure. "Like all nations, the United States has a compelling interest in defending its vital national assets, as well as our core principles and values, and we are committed to defending against those who would attempt to impede our ability to do so," Leuschner said. "Education is the key to promoting these ideals." With the designation, effective through 2022, MGA joins just over 100 education institutions nationwide, including just six others in the University System of Georgia: Georgia Tech, Kennesaw State, Columbus State,Armstrong State, University of North Georgia, and Augusta. According to Dr. Kevin Floyd, School of IT Program Chair and CCEAR Executive Director, The CAE-CD designation comes after a yearlong rigorous application process. The designation is a testament to the quality, state of the art programs and the exceptional faculty in the School of Information Technology at MGA. Graduates of the BSIT program will now have opportunities to pursue high-level jobs in cybersecurity with the Department of Homeland Security and other government entities to help protect and secure America’s vital national security infrastructure. Currently, the MGA School of Information Technology offers a bachelor of science in Information Technology with a concentration in cybersecurity which aligns with the CAE-CDE program criteria. The state of Georgia is home to more than 115 information security companies generating more than $4.7 billion in annual revenue and Georgia’s Fort Gordon is home to the U.S. Army Cyber Center of Excellence and U.S. Army Cyber School.